Here is the list of the hotels near Bizonnes. Book your hotel near Bizonnes today, Thursday 16 May for the best price, reservation and cancellation free of charge thanks to our partner Booking.com, leader in on-line hotels reservation. Below here is the list the 50 closest hotels of Bizonnes, sortable according your criteria. You will find the position of these accommodations on the Bizonnes hotels map. Set in a garden with a children's playground, Balad'âne offers a sun terrace, billiards table, and free Wi-Fi throughout. Bike rental is available on site and donkey rides are possible. The room at Balad'âne features a view of the garden, a mezzanine-style bedroom for children up to 15 years of age, and a private bathroom with a shower, toilet and hairdryer. A continental breakfast is available daily and it includes homemade products. You can also share meals with the host upon request. Balad'âne is 48 km from Lyon Saint Exupéry Airport, the A48 motorway is 10 km away, and free private parking is provided on site. Bed and Breakfast Mottier Preferred hotel ! Offering a sun terrace and sauna, Villa 630 is situated in Mottier, 42 km from Grenoble. Free private parking is available on site. The units offer a private bathroom with a shower, bathrobes and slippers. Some rooms feature a seating area to relax in after a busy day. Extras include free toiletries and a hairdryer. Villa 630 features free WiFi . There is a shared lounge at the property. You can play billiards at this bed and breakfast, and the area is popular for cycling. Villard-de-Lans is 44 km from Villa 630, while Bron is 46 km away. Grenoble - Isère Airport is 7 km from the property. Located in Charavines just 200 metres from Paladru Lake where guests can go swimming, sailing or rent a pedalo, Rossli features a restaurant, free bikes and free Wi-Fi. Free private parking is possible on site. The guest rooms offer an en suite bathroom with free toiletries and shower. They also have garden views, a wardrobe and parquet floor. Every morning, a buffet breakfast can be enjoyed on site. Guests also have access to a shared kitchen. Every Sunday, guests can visit the local market taking place 300 metres away. You can also drive 30 km to Walibi Adventure Park. Voiron Train Station is located 17 km away, while Grenoble Airport is 24 km away. Offering a restaurant with panoramic views and a private beach area, Beau Rivage is located in the rural village of Charavines, at the edge of Lac de Paladru. Free WiFi is available in public areas. All the rooms feature a wardrobe, an electric kettle and a flat-screen TV. The private bathrooms include a bath or shower and free toiletries. A nautical club can be found 200 metres away, where guest can practice windsurfing, canoeing and scuba diving. A tennis court is available 500 metres from the property. Other activities in the local area include hiking and cycling. Free private parking is available on site. Lyon Saint Exupery Airport is a 50-minute drive away, Grenoble, Chambery and Lyon are all located under a 1-hour drive from the property. Set in La Côte-Saint-André, hotel de france offers a garden. All rooms feature a flat-screen TV with satellite channels and a private bathroom. Free WiFi is available. At the hotel, the rooms are equipped with a wardrobe. All rooms are equipped with air conditioning, and some rooms will provide you with a balcony. Guests at hotel de france can enjoy a continental breakfast. Vienne is 41 km from the accommodation, while Bourgoin is 26 km from the property. Grenoble - Isère Airport is 9 km away. Boasting an outdoor swimming pool, la Ferme de Thoudiere is situated in Saint-Étienne-de-Saint-Geoirs. At the hotel, the rooms are fitted with a wardrobe and a flat-screen TV with satellite channels. The private bathroom is equipped with a bath, free toiletries and a hair dryer. Each unit has garden view and access to a terrace. A continental breakfast can be enjoyed at the property. Grenoble is 34 km from La Ferme de Thoudiere. Grenoble - Isère Airport is 2 km from the property. Featuring free WiFi, a 2750 m² garden, a secured seasonal outdoor pool, a barbecue and views of the Alps, Le Temps d'une Pause offers a family room in a renovated farmhouse in Cessieu. Free private parking is available on site in this homestay. The family room is equipped with a private bathroom with a shower, hairdryer and free toiletries. The room has a double bed, 2 twin beds and a sofa bed. Guests can use the property kitchen upon request. Guests also have a private access to a mezzanine level with a work station, a sofa bed, a bookshelf and a private shower room with a toilet. You can play billiards at the homestay. The homestay also offers bike hire. Bourgoin-Jallieu is 10 km from Le Temps d'une Pause, while Tour du Pin is 6 km away. Lyon is 48 km from the property and Aix-les-Bains is 43 km away. Le Temps d'une Pause is 7 km from the Lyon-Chambery motorway. The nearest airport is Grenoble - Isère Airport, 24 km from the homestay. Le Domaine de Dony features a seasonal outdoor swimming pool, garden and terrace in Balbins. Boasting a shared lounge, this property also has a restaurant and a children's playground. Staff on site can arrange airport transfers. At the guest house, all rooms come with a desk and a flat-screen TV. Rooms are complete with a private bathroom equipped with a shower, while some units at Le Domaine de Dony also offer a balcony. All rooms feature a wardrobe. A continental breakfast can be enjoyed at the property. Guests can take part in various activities in the surroundings, including skiing, cycling and hiking. Vienne is 39 km from the accommodation, while Bourgoin is 28 km away. The nearest airport is Grenoble - Isère Airport, 12 km from Le Domaine de Dony. Bed and Breakfast La Tour-du-Pin Preferred hotel ! Located on the outskirts of Nivolas-Vermelle, Symp’Hotel is 2 km from the A43 motorway and 13 km from the Trois Vallons Golf Course. It offers a garden, a terrace and free Wi-Fi access. All rooms feature a flat-screen TV and a private bathroom with a shower. Some rooms offer river views. A traditional breakfast is served every morning at Symp’Hotel. Vending machines for snacks and drinks are available at the hotel and restaurants can be found within 500 metres of the property. This hotel is 4 km from the Bourgoin Museum and 47 km from Lyon. Free private parking is available on site. Holiday home St Etienne de St Geoirs with a Fireplace 436 is set in Sillans. The accommodation is 47 km from Grenoble. This holiday home features a living room and a fully equipped kitchen. The holiday home offers a sauna. Guests can enjoy the indoor pool at the property. Bourgoin is 48 km from Holiday home St Etienne de St Geoirs with a Fireplace 436. Grenoble - Isère Airport is 3.9 km from the property. Located a 20-minute drive from Saint-Exupery Airport and a 2-minute drive from exit 8 on the A43 motorway, Gaïa Café offers a large garden, a traditional restaurant and modern-style studios with a private terrace. You can sample a drink at the bar. The soundproofed accommodations at Gaïa Café have air-conditioning, a flat-screen TV, an Ipod Docking Station and free Wi-Fi access. The bathroom is fitted with a walk-in, rain shower and includes a heated towel trail. The kitchenette on site provides a refrigerator, an electric kettle and a microwave. Guests can request a breakfast on site or a pizza to go. The property is the starting point of hiking trails and is located 5 km from Bourgoin Museum. 3 Vallons Golf Course is 12 km away. Located in Izeaux, just a 35-minute car journey from Grenoble, La Croisée des Chemins offers accommodation in a renovated farm set in a 6000 m2 park. It offers an outdoor swimming pool, free bikes, a children’s playground and free Wi-Fi. Accommodation features a private bathroom with shower. With its terrace, the chalet offers a living room with sleeping area on a mezzanine and a bathroom with shower. There is a fully equipped kitchen with microwave, stove and oven. Restaurants are located 250 metres away. Local activities include hiking, skiing, horse riding, cycling, medieval fetes and museums. The Chartreuse Distillery is located 15 km away. Free private parking is possible on site, Lyon can be reached in 1 hour by car and Grenoble Train Station is 42 km away. A shuttle service and long-term parking can be arranged at an extra cost. Chateau des Ayes - Chambre d'hotes in Saint-Étienne-de-Saint-Geoirs has a seasonal outdoor swimming pool and barbecue facilities. With free WiFi, this 3-star guest house offers luggage storage space. Staff on site can arrange airport transfers. Guests at the guest house can enjoy a continental breakfast. Guests can make use of the sauna. A number of activities are offered in the area, such as skiing and cycling. Grenoble is 48 km from Chateau des Ayes - Chambre d'hotes, while Bourgoin is 49 km away. The nearest airport is Grenoble - Isère Airport, 5 km from the property. Featuring a seasonal outdoor swimming pool, Chateau des Ayes provides accommodation in Saint-Étienne-de-Saint-Geoirs with free WiFi and garden views. The accommodation is 48 km from Grenoble. The holiday home is equipped with 8 bedrooms, a fully equipped kitchen with a dishwasher and a microwave, and 6 bathrooms with a shower. A flat-screen TV is offered. The holiday home offers a barbecue. A sun terrace is available for guests at Chateau des Ayes to use. Bourgoin is 49 km from the accommodation. The nearest airport is Grenoble - Isère Airport, 5 km from Chateau des Ayes. Offering free WiFi and garden views, Holiday Home Route de Bilieu is an accommodation situated in Chirens. This holiday home features barbecue facilities. This holiday home features 2 bedrooms, a TV, and a kitchen with an oven. Grenoble is 36 km from the holiday home, while Chambéry is 50 km from the property. The nearest airport is Grenoble - Isère Airport, 27 km from the property. Offering a restaurant , garden, BBQ area and private beach access, Camping du Moulin offers self-catering chalets and mobile homes located in Meyrieu. Free WiFi access is available. Each accommodation features a lake view, seating area, furnished terrace, and kitchenette with an oven, stovetop and microwave. Private bathrooms have a shower. At Camping du Moulin you will find a snack bar. Other facilities offered at the property include a shared lounge and a children's playground. An array of activities can be enjoyed on site or in the surroundings, including fishing and mini golf. Guests also have free access to the beach and to the water slides. 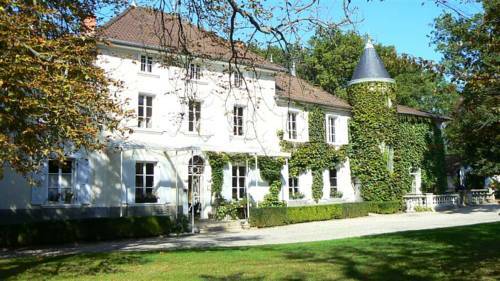 This property is 25 km from Lyon - Saint Exupery Airport. The property offers free parking. Set in the heart of the Dauphiné area, this family hotel welcomes you in a shaded park during your family holidays or your gastronomic break. Le Logis Le Pont de Champ features 13 comfortable guest rooms fitted with all the modern amenities you will need. You can fully unwind in the reading lounge available at the hotel. The Logis Le Pont de Champ also allows you to enjoy tasty specialities from the nearby area. Domaine des Séquoias - Les Collectionneurs is a boutique mansion from the 19th-century set in the heart of a 5-hectare park planted with old cedars. In the park, the seasonal outdoor swimming pool is the ideal place to enjoy a well-earned break. The reastaurant is open for lunch and dinner from Tuesday evening until Sunday lunch. The Domaine des Sequoias offers classic, spacious guest rooms with refined atmosphere, private bathroom, satellite television and free Wi-Fi Internet access. The nearby area offers many leisure activities like beautiful walks in the Isère countryside. Situated in Saint-Siméon-de-Bressieux, Sous Le Figuier features accommodation with a seasonal outdoor pool. Free WiFi is offered. The bed and breakfast offers a flat-screen TV and a private bathroom with free toiletries, a hair dryer and shower. A balcony with pool views is offered in all units. A continental breakfast is available every morning at Sous Le Figuier. The accommodation offers a terrace. Vienne is 48 km from Sous Le Figuier, while Bourgoin is 33 km from the property. Grenoble - Isère Airport is 9 km away. Set in an ancient renovated farm, this B&B offers rooms with free Wi-Fi, a hot tub and a big garden with deck chairs. Horseback riding and bike tours on the Alps can be done nearby. Each room at Saint Paul is decorated in a country style and the bathroom is shared with other guests. The breakfast is served in the dining room and during warmer months it can be taken on the terrace. From the garden, you can enjoy a panoramic view of the mountains. The Grenoble Charmeil Golf Club is 14 km away. Le Bain Train Station is a 10-minute drive away, the Grenoble-Isère Airport is 11 km away and the A48 Motorway access is 11 km from Saint Paul. Located in the centre of Bourgoin-Jallieu, only 200 metres from the train station, Mister Bed City Centre-Ville Bourgoin-Jallieu hotel offers en suite rooms with an LCD TV and free WiFi internet access. A buffet breakfast is served every morning and packed lunches are available upon request. The reception is open every day from 06:00 to 21:00. A wide range of bars, restaurant and shops can be found in the surroundings. The Theatre and the Tourist Office are situated 500 metres away. The medieval city of Crémieu is a 30-minute drive away while the Walibi Leisure Park is 35 km from the property. Lyon is a 40-minute away. Secure underground parking is available on site, which has a maximum height limit of 1.8 metres. Guests have access to a public car park at a discounted rate. Appart Meublé Bourgoin is situated in Bourgoin. This apartment also features free WiFi. This apartment has a living room and a fully equipped kitchen. A flat-screen TV with satellite channels is available. Lyon is 42 km from the apartment, while Villeurbanne is 42 km away. The nearest airport is Lyon - Saint Exupery Airport, 29 km from Appart Meublé Bourgoin. Set in Bourgoin, Appart Hôtel Bourgoin provides accommodation with free WiFi and flat-screen TV. Featuring a living room with a sofa, as well as a fully equipped kitchen, each unit has a private bathroom with shower and a washing machine. An oven, a microwave and toaster are also featured, as well as a coffee machine. Lyon is 46 km from the apartment. Lyon - Saint Exupery Airport is 32 km from the property. Chez Giancarlo&Pepita is a bed and breakfast located in Saint-Siméon-de-Bressieux and features a seasonal outdoor swimming pool. Among the various facilities are barbecue facilities and a garden. Free WiFi is included. The room has a wardrobe, a flat-screen TV and a private bathroom. A continental breakfast is available each morning at Chez Giancarlo&Pepita. The property offers a terrace. Grenoble is 40 km from Chez Giancarlo&Pepita, while Villard-de-Lans is 37 km from the property. Grenoble - Isère Airport is 7 km away. Guest accommodation Bourgoin Preferred hotel ! Atelier Liberation is located in Bourgoin. It has garden views and free WiFi. The holiday home has 3 bedrooms, a kitchen with a dishwasher and an oven, and 1 bathroom with a bath and shower. A flat-screen TV with cable channels is available. Speaking French and Italian, staff are willing to help at any time of the day at the reception. The holiday home offers a terrace. Guests can also relax in the garden. Lyon is 42 km from Atelier Liberation. The nearest airport is Lyon - Saint Exupery Airport, 29 km from the accommodation. Located in Saint-Paul-dʼIzeaux, Le Jardin Ombragé offers free WiFi, 6 km from Col de Parménie. There is also a kitchen in some of the units equipped with a microwave and fridge. A continental breakfast is available daily at the property. The bed and breakfast offers a children's playground. Guests at this property can enjoy cycling and hiking nearby, or make the most of the garden. The nearest airport is Grenoble - Isère Airport, 14 km from Le Jardin Ombragé. Featuring a private pool and city views, Le Panorama is situated in Bourgoin. This property offers access to free WiFi. The bed and breakfast comes with a flat-screen TV. A continental breakfast is available each morning at the property. Lyon is 43 km from the bed and breakfast, while Villeurbanne is 43 km away. The nearest airport is Lyon - Saint Exupery Airport, 30 km from the property. Situated 30 minutes outside the centre of Lyon, 20 minutes from the airport, 20 minutes from Eurexpo and a 5-minute walk from Medipôle de Bourgoin Jallieu, Kyriad Bourgoin-Jailleu offers a fitness room. All of the guest rooms are equipped with free WiFi access and a flat-screen TV. All are non-smoking, and 4 of them are adapted for people with disabilities. An all-you-can-eat buffet breakfast is served at hotel Kyriad Bourgoin-Jallieu from 06:30 until 10:00 on week days and from 07:00 until 10:00 on week-ends. The bar and snack service are open 7 days a week. There is free on-site parking and a multilingual staff at reception. Espace Conference offers self-catering accommodation in Les Abrets, 31 km from Aix-les-Bains. The property is 41 km from Grenoble and free private parking is available. Free WiFi is featured . There is a seating area, a dining area and a kitchenette as well as a private bathroom. Towels and bed linen are offered in this self-catering accommodation. Chambéry is 26 km from Espace Conference, while Saint-Sylvestre is 48 km away. The nearest airport is Grenoble - Isère Airport, 28 km from the property. Boasting free bikes and free WiFi, Les Petits Registres is set in Voiron. Guests can enjoy garden views. Some rooms are equipped with a kitchenette with a microwave, a fridge and a stovetop. Aix-les-Bains is 44 km from the guest house, while Grenoble is 23 km away. The nearest airport is Grenoble - Isère Airport, 20 km from Les Petits Registres. Located in Voiron, in the Isère region, Best Western Palladior features a bar and a restaurant with terrace. Only 20 km from Grenoble Airport, it provides a free high-speed WiFi connection throughout the property. The air-conditioned rooms and suites at Best Western Palladior all include a private bathroom with hairdryer and free toiletries. They are also equipped with satellite TV and tea and coffee making facilities. A buffet breakfast is available in the morning with a surcharge. The on-site restaurant serves a selection of light meals and snacks, and offers a wide choice of wines. Sometimes on a Friday, an all-you-can-eat seafood buffet including hot and cold fish dishes, shellfish, salads and a glass of white wine may be available. With free private parking on site, the hotel is only 15 minutes by car from Grenoble and the Technopole Technology Centre. Lyon - Saint-Exupéry Airport and Lyon - Saint-Exupéry TGV Train Station are both a 40-minute drive away. Offering a garden, a terrace and BBQ facilities, La Rolandière is located in Faverges-de-la-Tour. Free WiFi access is available. Each room here features heating and garden views. The triple and quadruple rooms have a shared bathroom and toilet. A continental breakfast is served every morning. Evening meals and wine are available, upon prior request. Lyon - Saint Exupery Airport is 47 km away. The property offers free parking. Featuring free WiFi throughout the property, la chaumière offers pet-friendly accommodation in Voiron. Free private parking is available on site. The rooms have a flat-screen TV. Rooms are equipped with a private bathroom. You will find room service at the property. Snacks and light meals are available. Aix-les-Bains is 45 km from la chaumière, while Grenoble is 22 km away. The nearest airport is Grenoble - Isère Airport, 20 km from la chaumière. Gite l'Ecoline is a holiday home located in Brion, 32 km from Grenoble. Guests benefit from terrace. Free WiFi is offered throughout the property. The kitchen is fitted with a dishwasher, an oven and a microwave, as well as a coffee machine. Towels and bed linen are featured in this holiday home. Free private parking is also available at this holiday home. You can play table tennis at the property, and the area is popular for skiing. Villard-de-Lans is 29 km from Gite l'Ecoline, while Chamrousse is 46 km away. You can engage in various activities, such as horse riding and cycling. The nearest airport is Grenoble - Isère Airport, 9 km from the property. Located in Vignieu and set within an 8 hectare garden with a heated swimming pool, Domaine de Suzel offers a variety of accommodation in an 18th century building. Free WiFi is available throughout the property. Morestel is 7 km away. All rooms have a private bathroom. A continental breakfast comprising cold meats, cheeses and croissants is served daily. Dinner can be reserved upon request. There is a supermarket 1 km from Domaine de Suzel and restaurants can be found within 2 km. The property has a fishing pond and a pétanque pitch, while popular activities in the local area include cycling and hiking. The medieval city of Crémieu and Walibi Park are both accessible within a 21-minute drive of Domaine de Suzel. The property is located a 20-minute drive from the A43 motorway. Tour-du-Pin Train Station is situated 20 km away and Lyon Airport can be reached in 40 minutes by car. This 13th-century chateau is located in Vignieu, in the Rhône-Alpes region. It is set in a large wooded park and offers a heated swimming pool and free WiFi access. Each guest room at the Château Chapeau Cornu is individually decorated and includes a TV and a private bathroom. Some rooms also have 4-poster beds. Some rooms are located in an annex building. A buffet breakfast is available every morning. An express breakfast consisting of a coffee, orange juice and pasties can also be served. La Capella is the chateau’s gourmet restaurant, which serves traditional French cuisine. Guests can relax on the sunny outdoor terrace overlooking the pool and park. The Château Chapeau Cornu is 8 km from Morestel and 11 km from La Tour du Pin. Saint Exupéry Airport is 35 km away. For guests visiting by car, free private parking is available. Holiday home Saint Jean de Moirans with Sauna 435 is set in Saint-Jean-de-Moirans. Guests staying at this holiday home have access to a fully equipped kitchen. Grenoble is 23 km from the holiday home, while Chambéry is 46 km away. The nearest airport is Grenoble - Isère Airport, 22 km from the property. Located in Corbelin, 47 km from Aix-les-Bains, Chateau-Gaillard features a garden and free WiFi. There is a fully equipped private bathroom with shower and free toiletries. A continental breakfast is available each morning at the property. The bed and breakfast offers a terrace. Guests can also relax in the shared lounge area. Chambéry is 40 km from Chateau-Gaillard. Chambéry-Savoie Airport is 41 km from the property. Situated in Marnans, L'Auberge has free bikes. The property features a bar, as well as a restaurant serving French cuisine. Free WiFi is included. All guest rooms in the inn are fitted with a kettle. All rooms have a flat-screen TV, and selected rooms also feature a river view. The rooms feature a private bathroom. L'Auberge offers a terrace. Cycling and fishing are among the activities that guests of the accommodation can find nearby. Vienne is 47 km from L'Auberge, while Bourgoin is 38 km from the property. Grenoble - Isère Airport is 15 km away. Premiere Classe Lyon Est - L'Isle d'Abeau is located a 5-minute drive from L’Isle-d’Abeau and a 20-minute drive from Lyon-Saint Exupéry Airport. It provides free WiFi access. Each room includes a flat-screen TV with satellite channels and a private bathroom fitted with a shower. A buffet breakfast is available daily in the breakfast room. Free private parking is possible on site. Access to the A43 motorway is just a 3-minue drive away, and Lyon city centre is at a 30-minute drive. Situated 15 minutes from the Airport and 30 minutes from Lyon’s city centre, this hotel boasts a privileged location from which you can explore the picturesque Rhônes-Alpes region. Eurexpo Exhibition Centre is a 30-minute drive away. There are 55 'new generation' rooms at the Campanile Hotel, each with en suite facilities and fully equipped living spaces. There is an on-site restaurant and when closed the hotel can provide meal trays on request, or can arrange meals for small group meetings or seminars. Attentive staff will try their best to help you make the most of your stay whether you are on a business trip or a family holiday. Below here is the hotels map of Bizonnes. Names and details of Bizonnes hotels can be shown on the map clicking on the prices icons.